The upcoming 2014 Dakar Rally is proving to be as exciting as in years past. Several of the familiar manufacturers are set to enter, as well as some new faces. The route for this spectacular all terrain race is sure to put up a challenge for all who participate. 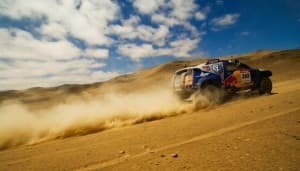 The 35th Dakar Rally is set to begin on January 5th in Argentina’s city of Rosario, ending in Chile’s Valparaiso. The 2014 route for the Dakar Rally will start in Rosario. Contestants will head west to Salta in the direction of the Andean Mountain Range. From this point, the rally is divided into two groups. Quads and motorbikes will follow a route to Bolivia, while trucks and cars will go to the Chilean Atacama Desert. From the desert, the path goes by Iquique and Antofagasta and passes La Serena on its way to the finish line in Valparaiso. Many familiar names appear in the bike division. This includes the big name manufacturers such as KTM, Honda, Husqvarna, and Yamaha. Honda and Yamaha will also be entering Quads, along with Can-Am. Under cars one can expect to see the world wide known brands of Mitsubishi, Toyota, BMW, and Isuzu. Kamaz, Tatra, Mercedes, and Renault will all be represented in the trucks. New to the Dakar Rally in 2014 is Team Ford Racing. They’ll be entering two of their Global Ranger pick-up trucks that are designed in South Africa. It’ll be exciting to see how they perform up against several of the returning teams. Among the returning groups are Toyota Motorsports of South Africa. They have a team that will include Dakar champs Dirk von Zitzewitz and Giniel de Villiers. New to the Toyota team is Rob Howie who is coming in as a navigator and Leeroy Poulter as a driver. They plan to once again use their Hilux. They’ve used the Hilux in the past two Dakar Rallies, finishing second in 2013. Keep an eye out for the 2013 model in the line-up. From the all-terrain route spanning Rosario to Valparaiso to the top name manufacturers participating, the 2014 Dakar Rally is sure to be exciting. Much anticipated by fans the world over; this year’s rally won’t let them down.